The Medicare Shared Savings Program (MSSP), or Shared Savings Program, was created by the Centers for Medicare and Medicaid Services (CMS) as part of the Affordable Care Act (ACA) of 2010. Launched in 2012, the MSSP has become a key component in Medicare delivery payment reform, utilizing Accountable Care Organizations (ACOs) to lead the transformation from fee-for-service (FFS) to value-based health care. Now in its sixth year, the MSSP has grown from 220 ACOs to 561 participating ACOs in 2018. These voluntary networks of physician groups, specialists, surgeons, pharmacists, care managers, primary care doctors and hospitals strive to provide cost-effective, quality-care coordination, delivery, and outcomes for a specific patient population, and the MSSP incentivizes them by sharing a percentage of the ACO’s Medicare Part A and B realized savings. With Medicare spending expected to grow to $1.4 trillion by 2027, some have expressed concerns that quality may be compromised under the MSSP, as ACOs are charged to reduce spending and control costs. However, the MSSP is structured to emphasize quality performance, even establishing shared savings as contingent upon achieving high-quality care and improving that care over time. The Medicare Shared Savings Program is one of the largest Alternative Payment Models (APMs) in MACRA’s Quality Payment Program (QPP), and ACOs are instrumental in the long-term strategy of coordinating care to improve quality and value. The MSSP has seen initial success in realigning incentives that reward value-based care rather than volume-based care. The Office of Inspector General’s August 2017 Report on MSSP ACOs states that over the first three years of the program, 428 participating ACOs served 9.7 million beneficiaries, and most ACOs were able to reduce Medicare spending and improve quality of care. ACOs join the MSSP for a minimum three-year contract period. CMS assigns a quality performance standard for each ACO performance year that is the same regardless of ACO track (Track 1, 1+, 2, or 3). In year one, the ACO is scored on a pay-for-reporting (P4R) criteria. In its first year, to be eligible for any earned shared savings, an ACO must completely and accurately report its quality performance to achieve its full total shared savings rate, applicable to track model. In year two and ongoing, ACOs are scored on a pay-for-performance (P4P) criteria, which scores the ACO on its actual performance compared to national quality benchmarks set by CMS. 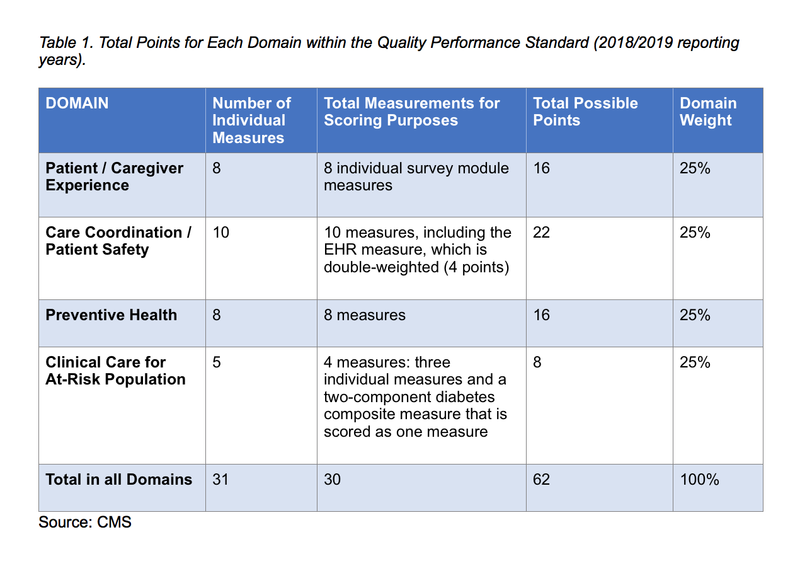 The pay-for-performance criteria requires ACOs to completely and accurately report all quality measures as well as meet the minimum attainment (30+ percentile) on at least one measure in each domain. It is interesting to note that four measures are pay-for-reporting in every year of the ACO contract period. If an ACO fails to meet the minimum quality performance standard for its performance year, then it loses eligibility for shared savings payments, and CMS may initiate corrective action or terminate the ACO from the program for non-compliance. CMS assigns quality performance benchmarks for each measure based on data reported or collected through the Physician Quality Reporting System (PQRS), through claims or a registry, through the CMS Web Interface, or through the Consumer Assessment of Healthcare Providers and Systems (CAHPS). Benchmarks for 2018-2019 were established using 2014, 2015, and 2016 available and applicable data from Medicare fee-for-service (FFS) and Medicare Advantage providers, and these benchmarks apply to all ACOs in the MSSP. Within the MSSP, ACOs choose one of four track options, each carrying different levels of risk and potential rewards for shared savings. Track 1 is “one-sided risk,” and ACOs are eligible to receive up to 50% of shared savings, without any risk of losing money if costs exceed CMS standards. Tracks 1+, 2, and 3 are “two-sided risk,” offering ACOs varying percentages of possible shared savings (up to 50%, 60%, and 75% respectively) if they meet the highest standards of quality performance. Two-sided risk arrangements also require ACOs to pay back money to CMS if costs exceed CMS defined thresholds (for a detailed comparison of track options, see TXCIN’s article ACOs and the Medicare Shared Savings Program). To calculate an ACO’s shared savings rate, CMS assigns points on a sliding scale associated with an ACO’s performance level for each quality measure (see Table 2). 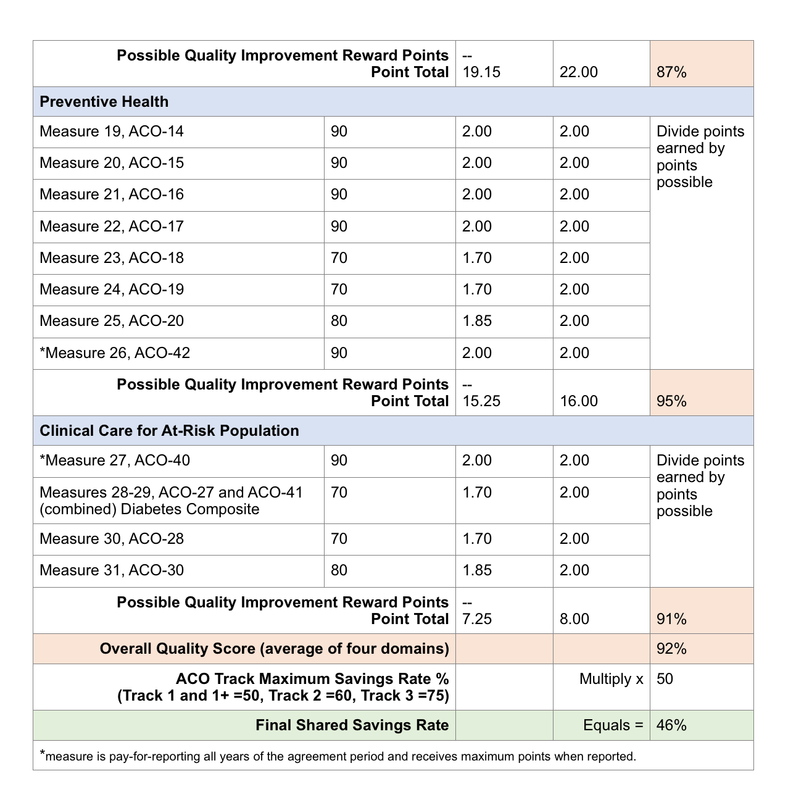 CMS awards ACOs up to two quality points per measure for exceptional performance, reaching the 90+ percentile benchmark (except for measure ACO-11 which is double-weighted, and measures ACO-27 and ACO-41 which are combined). Each domain is scored separately, and to find the percentage of quality CMS divides the points earned by the number of points possible in each domain and multiplies by 100. Each domain affects the overall quality score equally, so CMS adds the domain percentage totals together and divides by four. This overall quality score is multiplied by the track’s maximum savings rate to arrive at the ACO’s adjusted total shared savings rate (see Table 3). Clearly, the higher ACOs can score in each domain, the more shared savings they will receive overall. In years two and beyond, ACOs can see an even greater increase in shared savings through quality improvement, because CMS takes into account not only the attainment of quality measures but also the improvement in performance over time. 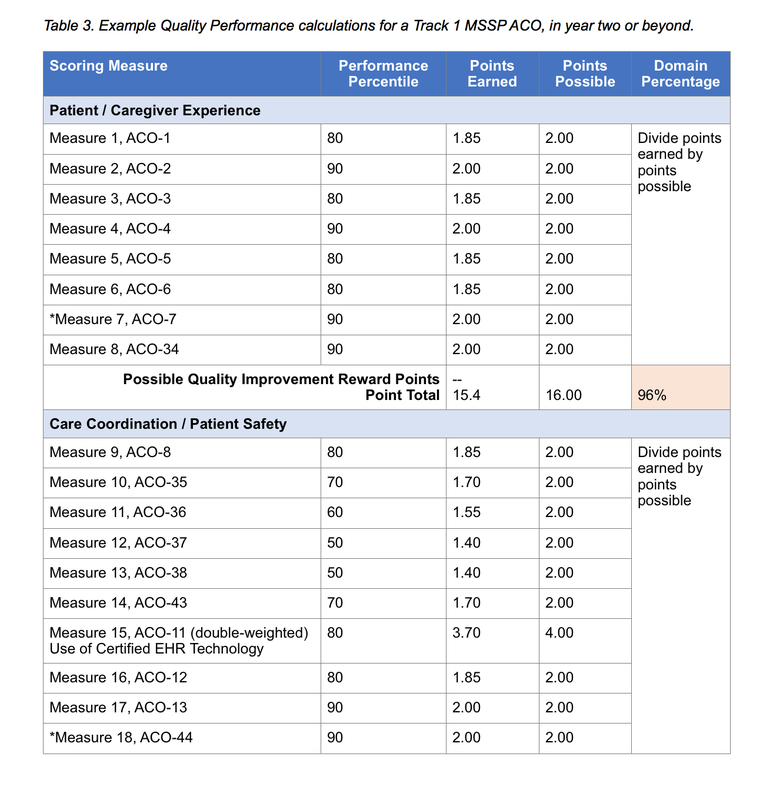 When calculating an ACO’s overall quality score and final shared savings rate, CMS rewards ACOs that demonstrate improvement in performance from previous years by giving them a Quality Improvement Reward of up to four additional points per domain (total points earned in a domain cannot exceed the total possible points for a domain). These additional points would be added to the point total for each domain and divided by the points possible to achieve a higher domain percentage, thus, an overall higher shared savings rate. The level of ACO performance on quality measure attainment and improvement over time has a significant impact on an ACO’s total shared savings rate. ACOs must focus on scoring high on quality measures, as well as cutting costs, in order to receive the greatest amount of shared savings. By successfully focusing on the quality of patient and caregiver experience, care coordination and patient safety, preventive health, and clinical care for at-risk populations, ACOs will set the course for sustainable value-based healthcare, and they can see significant financial rewards for their efforts. DHHS. “Medicare Shared Savings Program Accountable Care Organizations Have Shown Potential for Reducing Spending and Improving Quality.” Office of Inspector General. U.S. Department of Health & Human Services. https://oig.hhs.gov/oei/reports/oei-02-15-00450.asp. August 2017.